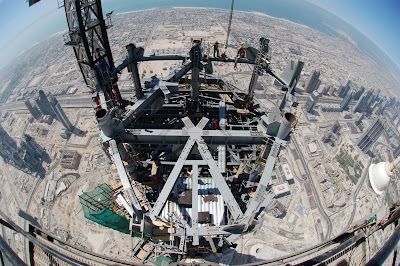 Check out this picture that was sent to me from the top of Burj Dubai, the tallest structure in the world. The small buildings in the corner of the picture are around 50 stories high! As of April 07, 2008, they had reached 629m, and still they're building! Couldn't find who made the photograph, but credit of course goes to that person!